The organic extra virgin Superior olive oil Armonia is derived from a combination of semi-ripe and ripe olive fruit of Koroneiki variety, hand selected and cold extracted within hours at 21 – 23 °C with very low acidity, usually between 0,1% and 0,2%. Armonia organic extra virgin olive oil, is a unique olive oil, which has medium intensity, with fruity aromas, golden green color, vitamins, organoleptic properties with aromas of herbs, wild greens, rich flavor, fine taste. It is an organic olive juice, superior, an organic evoo with balanced and characteristic flavor stability, as well as prolonged aftertaste. Armonia cold extracted extra virgin olive oil, is an olive oil rich in vitamin E (a tocopherol) as well as polyphenols that contribute to the protection of blood lipids from oxidative stress, contains antioxidants and beneficial nutrients and is compliant with the regulation 432/2012 of the European Union, regarding claims of health benefits of olive oils with high polyphenol concentration. 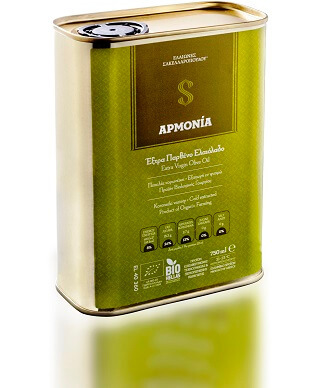 Armonia organic extra virgin olive oil, is a Superior limited edition olive oil that belongs to the category of bio functional olive oils and has been awarded many times in international olive oil taste competitions, rendering it one of the most unique and multi-awarded Greek organic olive oils.